Share Strange Dimensions -- send it on! If you'd like to subscribe to this free monthly newsletter on paranormal and metaphysical topics, sign up on the home page at visionaryliving.com. You may unsubscribe at the end of this newsletter. My work embraces everything in the metaphysical and paranormal fields. If you would like to reprint any article from the newsletter on your website or in publications, please include my by-line, Rosemary Ellen Guiley, a copyright notice for Visionary Living, Inc., and a link to my site, www.visionaryliving.com. Thank you for your courtesy. Remarkable phenomena manifested several times during black mirror workshops that I conducted during the last part of October. I gave workshops in black mirror scrying (gazing) for contacting the dead in Connecticut, Ohio, and Salem, MA. The black mirror serves as a doorway that provides access to other realities where contact can take place. It's not unusual to have phenomena manifest during mirror sessions, which involve intense psychic work on the inner and astral planes. However, at one workshop in Ohio, some dramatic events occurred. I was giving the second of two workshops at the Universal Life Expo, held at the Convention Center in Columbus, OH. The first workshop was filled to capacity, and the second workshop had a few attendees. Sometimes the most phenomena happen when the room is "quieter" in a psychic sense. I usually allow for a 30-minute journey into the mirror, a time when the room is still save for a background OM chant. The lights are dim but not off altogether. As soon as the journey time commenced, we were subjected to booms and crashes that sounded like they were coming from the floor above. While it is possible that the noises had a natural explanation, the timing was uncanny. The sounds had not erupted earlier during the orientation lecture or training exercises. About 10 minutes into the journey period, the room lights, which had been lowered with a dimmer switch, suddenly went completely out and the room was plunged into darkness. No one was near the light switches, which were at the back of the room. Almost as suddenly, the lights flashed on to maximum brightness. I told everyone to hold their focus in the mirror, and I went to the back of the room and restored the dim lighting. I sat back down in the front of the room and resumed my own meditation. Then something else odd occurred: the sound of a rattle being shaken, such as during a Native American ritual. The sound emanated from the corner opposite me in the front of the room, and was loud enough to be heard over the background OM that was playing. During the discussion period that followed, we ascertained that the phenomena related to one attendee's intense experiences in the mirror. She was part Native American, and she said she had had other times when phenomena manifested around her during psychic and spiritual work, including exploding lights. At least we didn't have that! At a black mirror workshop for the Golden Rods chapter of the American Society of Dowsers in Milford, CT, presences manifested in the room during the journey time. I have seen this happen quite a bit -- the dead and other beings are called in by the contact requests. I often see or sense them moving around in the room. One woman asked during her journey if there was a deceased loved one who wished to communicate with her. She then felt a tangible presence standing next to her, touching her hair. It was so real that at first she thought Joe or I had somehow moved around the room, which we had not. She got additional signs of contact the next day as well. This, too, is often the case in black mirror scrying -- the mirror starts a process that finishes in the most appropriate way and time for the individual, such as through synchonicity, signs, and dreams. 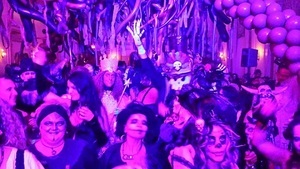 My final black mirror event of the year took place in Salem, MA on October 30, as part of Christian Day's Festival of the Dead. Once again, presences of the dead manifested in the room during the journey time, and most participants had meaningful experiences in their mirror. I had two appearances for Coast last month. One was my annual live chat, moderated by Coast webmaster Lex Lonehood, for Streamlink subscribers. It was, as always, lively with great questions on a variety of topics. On October 29, I was on the show with George Noory talking about ghosts, hauntings, and other spooky topics. 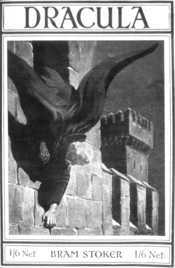 I relayed a story about a strange bat that crashed a stage production of Dracula, which you can read in the Feature Article below in the newsletter. I also talked about Black-Eyed People and Shadow People -- see details also below in the newsletter. It was fantastic fun, and we are already planning our attendance for next year's ball, also on October 31. 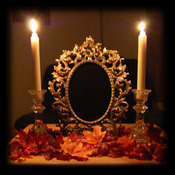 My "Portal to the Spirit World" black mirror event will be on Thursday, October 29. Tickets will go on sale early next year, and the necromanteum has sold out every year, so don't delay! Rick Fisher and I are collecting more stories about the Ouija for our book commemorating the 125th anniversary of the board in 2015. We are seeking stories of all kinds, good, neutral, and frightening. Thanks so much to all who have responded to the call to date -- we have some great new material. Ouija historian Bob Murch is organizing a conference during the weekend of April 25-27, 2015 in Baltimore, MD to celebrate th anniversary, and we will be there. To submit stories, please email me at reguiley@gmail.com. I have some terrific events coming up in Berkeley Springs, West Virginia this weekend -- see below. My final workshop of 2014 will be "Dream Visits from the Dead" at Omen in Salem, MA, October 15. See you on down the Paranormal Road! I'm pleased to announce my appearance at the prestigious Conscious Life Expo in Los Angeles February 6-9, 2015 at the LAX Hilton. I will give a workshop on "Dream Visits from the Dead" and participate on a panel on the afterlife moderated by George Noory, host of Coast to Coast AM. I will also have a booth in the Exhibit Hall. The Conscious Life Expo is attended by about 12,000 people every year. Research on the afterlife will continue to be a prime focus for me in 2015, and will be a presentation theme of mine at other major events throughout the year, including the "Life in the Afterlife" conference in Scottsdale, AZ, September 25-27, sponsored by the Academy for Spiritual and Consciousness Studies. On Thursday, November 6 I will be in Berkeley Springs, WV for a special evening presentation on "Haunted by the Things You Love," featuring true cases of objects with spirit attachments and curses, based on the book by the same title that I have written with John Zaffis. The lecture will run from 7-9 PM at the Ice House, at the corner of Mercer and Independence Streets. Tickets are $8 at the door. On November 8-9 I will be at the annual Festival of Light psychic fair in Berkeley Springs, also held at the Ice House, from 10 AM-5 PM. I will give readings and sell books and black mirrors at my table. On Sunday, I will give a short talk on dream incubation for guidance from 1-1:30 PM. Reports of encounters with adults and children who have solid black eyes are on the rise. Black-eyed adults and black-eyed kids -- now collectively called Black-Eyed People -- have been documented for about 30 years now, and they may be the latest versions of a much older phenomenon involving the Trickster, demonic entities, or Djinn. The BEP look like humans -- though they may seem weird or "off" -- but have solid black eyes, and sometimes mouths full of saw teeth. The BEP approach people -- often in parking lots -- and want their attention or help. If a person looks into their eyes or is touched by them, ill effects follow, such as an outbreak of troubling paranormal phenomena, a run of bad luck, or an onset of health problems. Sometimes the BEP, especially in child form, knock on the doors of homes and ask for help or to come inside. Even though the "children" have a strange vibe that makes people uneasy, the victims often automatically respond to give assistance. In other cases, people encounter strangers, or strike up relationships with individuals, whose eyes shapeshift to solid black. Last month I had the following exchange with my friend John Frick of Cumberland, Maryland. John and his brother, Tim, are famous as the "Men In Black" at the annual Mothman Festival and on cable television. John and Tim have had numerous strange and paranormal experiences, and this one occurred in the Cumberland area on the date of the partial solar eclipse, October 23. John described an encounter with an odd woman with black eyes. John: I was on the way out of Sears about 4:45 PM, intending to drive up to a mountain top to watch the eclipse about an hour later. So I am walking out of Sears and there is a white car sitting there just outside the door, with a woman standing next to the back passenger side door. She is standing there, facing the same way I am walking (so I did not see her face). Just as I am parallel to her she says out loud, "Take a look!" I did not look, just figured she was calling out to the lady about 30 feet from her across the lot. Then she immediately says, "Take a look at my eyes!" in an even louder voice, this time sounding a little angry, and it started to seem that she was talking to me. She then immediately followed that with, "They're all black!" (putting emphasis on black). At this point she definitely got my attention. I now figured she was talking to me. I did not turn around and look, just kept walking to my van which was maybe 40 feet from the car she was with. It took me maybe 5-7 seconds to get in my van, then quickly turn to look to see if she really did have black eyes, but she had just gotten back in the car (into the back seat). The car pulled off, and I started up and got behind the car. It had a normal looking Maryland plate. There appeared to be three women in the car. I did not see any of their faces. I let them go their own way. No way was I going to chance following a car full of black-eyed women!! I am used to strange coincidences, but I get the feeling that had I turned and looked at her face she may really have had black eyes. Rosemary: You might have had an encounter with a Black-Eyed Person. It was a good thing not to look into the eyes or have any contact, which brings bad luck and ill health. John: I almost got in two accidents within 30 minutes of encountering that woman. Both times vehicles next to me carelessly cut over into my lane and I had to swerve or slam on my brakes to avoid crashing. The almost-accidents could be a flukey coincidence, but later I put the pieces together and it sort of seemed like something didn't want me to make it up to that hill to watch the eclipse. For example, had I turned and looked at that woman's face, and her eyes had been black, I most likely would not have taken the 20-minute drive to sit on a mountain with the added fear that the car with the black-eyed woman would come along while I was up there. It could all just be synchronistic trickery and have no meaning at all, but I am wondering. Rosemary: From an occult perspective, eclipses open up a strange borderland reality that may allow bleedthroughs from otherworldly realities. Even though this eclipse was partial, it still exerted an effect, and may have been a factor in your experience. "I dated a man for almost two years and when I ended the relationship he stood and looked me in the eyes and his blue eyes turned black, not only the the blue but the whites also...I have been haunted with this image ever since...I spoke with him over the phone and called him on it by saying "I saw your eyes turn dark" and his response to me was "see what you do to me"...I was hoping you could lead me in a direction where I can understand and put to rest." 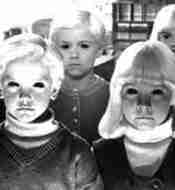 Black-Eyed People have been reported in paranormal encounters since about the 1980s. They are a modern version of a very old phenomenon, called in the past demons, devils, dark fairies, Djinn, the Trickster and so on. They are associated with supernatural entities that have a damaging effect on people, i.e., bad luck, ill health, negative paranormal phenomena, etc. Seeing someone’s eyes turn dark could have various meanings, however, beyond BEP. It could be an intuitive sign to steer clear of a person for a host of natural reasons. 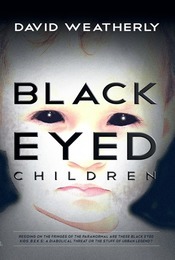 For more information on this phenomenon, see David Weatherly’s excellent book, Black-Eyed Children. Here’s a strange and funny story from my Halloween adventures on the paranormal road, involving a bat that was either uncannily shrewd or else supernatural. In October, I spent some time with Al Kelchner, owner of the haunted Willow Creek Farm in Shannon, IL, and we took a day trip to Galena, IL, on the Mississippi River. In the 19th century, Galena was an important river town that could accommodate mighty steamboats. The port is silted in today, but the town has a large and fascinating historic district that draws many tourists. Al took me to his favorite chocolate shop, Chocolat, where I met several of the staff. One, a man named Chris, told me a great story about an unusual bat. Back when he was a youth in Galena, Chris participated in a Halloween-season production of Dracula at the local theater. There were four performances. In one of the scenes, an artificial bat dangling from a string was bounced around over the stage. On opening night, much to the astonishment of the performers and the delight of the audience, something bizarre happened. When the artificial bat was bobbed out over the stage, a real bat suddenly appeared from the rafters and started swooping around. The bat stayed over the stage and did not fly out over the audience. When the scene was done, the real bat disappeared into the back reaches of the theater. The audience loved it and assumed this was a planned stunt. Incredible – how did the crew manage to get a real bat to perform on cue? The cast and crew were puzzled – no bat had been seen in the theater, and how this one managed to fly out at just the right moment was unexplained. It couldn’t happen again. Amazingly, the same thing happened during the second performance. When the artificial bat was sent out, the real bat appeared out of nowhere and swooped the stage, disappearing when the scene was over. The mystery deepened. This seemed like no uncanny coincidence. It was as though the real bat knew when it should make its stage entrance and then depart – like it was one of the actors in the play. No one thought it could happen a third time – but it did. Exactly like the first two times. This bat was a real performer! Worried that the bat might show up again and perhaps fly out over the audience, the crew tried to locate the bat and get rid of it. They moved around the stage and theater bouncing balls on the hard floor. Bats, explained Chris, will hear the sound and follow it down, enabling a person to swat them with a broom. The bat did not take the bait. It was nowhere to be found. On the fourth and final night of Dracula, the cast and crew were in heightened expectation. Would the bat show up again on cue? The scene involving the fake bat commenced. The prop was dangled out over the stage. By now, the real bat was famous, and the audience waited in hushed anticipation of its entrance. Nothing happened. For a few moments, it seemed the real bat would be a no-show. The disappointment was palpable. And then, just in time, in swooped the real bat. The audience applauded and cheered. Like a celebrity enjoying the attention, the bat flew around the stage, and vanished at the end of the scene. The bat was never seen again. Was it a real bat -- or something else from another reality? Q: I tried meditation one time as a requirement for my psychology class. During my meditation experiece I saw this dark-greyish entity. It made me feel unconfortable and even somewhat fearful. is this a normal experience during meditation? This entity was not the only one I saw; I also saw a not so bright light but it was white and to some degree bright. But this one made me feel confortable and even safe. Can this “entity” be a shadow entity as well? Both of them? One? What can you tell me about this? -- C.
A: From your description, I gather you are a beginner in meditation and psychic perception. When the third eye opens, it is possible to perceive other beings and well as a variety of lights. Simply perceiving them can be unsettling to a beginner, regardless of what or who they are. It is not possible for me to opine on what you saw based on your description, compounded by the lack of communication between you and either presence. These may have been random images from the subconscious called up by your expectations, uncertainties, and even anxieties about meditation. If they were genuine psychic perceptions of entities, then we have to take into account that beginners are not likely to perceive the same detail as individuals who have developed their psychic skills – it can be like trying to see the details of a person through fog. If you are serious about exploring more, taking training in psychic development – even basic energy healing -- will provide structured ways to open the third eye and practice evaluating what you get. Also, it’s a good idea to do some study in the literature of what’s out there. As for meditation, I recommend it as a daily practice for a variety of purposes: stilling and clearing the mind; centering and grounding; building spiritual foundation; strengthening the aura; attaining higher states of consciousness; focusing intention; and having focused contact with the spirit realms. In disciplined meditation, one learns how to release distracting thoughts and images. Zen meditation is particularly good for that. Q: I came by your website as I have purchased a pendant bound with a female Djinn. Last night I was reading your website, www.djinnuniverse.com. I read a lot from the detailed message posts and was shocked and freaked out [by the problems and hazards of working with Djinn].This Djinn is a believer [Muslim] and is one for memory, intelligence, knowledge and wish granting. Can you advise me what to do, and will I be harmed if I ship the package back without opening it? I don't want to upset the Djinn in any way, not wanting her. It's just I don't need the harm if she turns nasty. -- M.
A: I don't think you will incur harm from returning the package unopened. Djinn are going to go where they have been given an opening. As you may have seen on the Djinnuniverse site, there are differing opinions on whether or not it is advisable to work with Djinn. The weight is overwhelmingly on the side of "don't do it," which is my advice as well. I have interviewed people who claim to have beneficial relationships, usually with believer Djinn. However, as one of Djinnuniverse's key contributors, Mahmoud, notes, the Djinn are slippery and maintaining an upper hand can be difficult -- they have a way of making people work for them, not vice versa. There is always a price to pay. Mahmoud also said that most Djinn jewelry is questionable, and at best items might be empowered by Djinn but not actually carry Djinn attachments. Note that I am not casting doubt on this particular item, or on the person who offered it for sale. There is always the possibility that some Djinn might allow themselves to be attached to items for the purpose of finding humans for attachment. It's uncertain territory, and given the overall risks, I always advise people against engaging with Djinn. There are some accounts of Djinn "companion" attachments in The Vengeful Djinn and The Djinn Connection that you might find eye-opening as well. As for your situation -- you are entitled to change your mind, and anyone who is ethical in the magical community knows that it is not a good idea to undertake anything involving the spirit realms when there is uncertainty and worry. 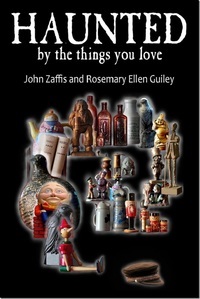 Haunted By The Things You Love, an Amazon best-seller, features some of the strangest and creepiest cases of haunted and cursed objects from John Zaffis's unique Museum of the Paranormal, plus how and why objects become haunted, how to recognize problem objects, and remedies. The book is available in print on Amazon and in e-book on Kindle, Nook, iTunes and Kobo. Autographed copies are available on my website Visionary Living. My guidebook on black mirror scrying, available in both hard print and e-book formats, delivers everything you need to know about how to use black mirrors for spirit communication, past life exploration, astral journeying, and clairvoyance or remote viewing. Black mirror scrying often stimulates productive dreaming, creativity, and enhanced intuitive and psychic abilities. "Scrying" comes from an old English term, "descry," which means “to succeed in discerning” or “to make out dimly.” In black mirror scrying, you gaze steadily into a mirror that is solid black, not silvered, until visions appear. People also have auditory results. 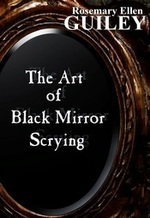 The Art of Black Mirror Scrying covers a short history of divination by mirrors, crystals and shiny surfaces, and explains in detail how to select, use and care for a black mirror. There are training exercises to limber up the third eye, and instructions for a variety of uses and applications. Plus, I give instructions for making your own custom black mirror. Ouija Gone Wild, which I co-authored with Rick Fisher, features the most comprehensive history of the Ouija published to date, as well as an examination of why so many users have bizarre and weird experiences. Outrageous stories from history, original and hair-raising stories from the present, a Ouija filmography and helpful how-to-use tips make this book a must for paranormal enthusaists and investigators. My ground-breaking book on the Djinn, The Djinn Connection: The Hidden Links Between Djinn, Shadow People, ETs, Nephilim, Archons, Reptilians and Other Entities, has reset the parameters for all of our paranormal experiences, including hauntings, entity encounters, ancient aliens and gods, and alien abductions. If you've been hearing about it and haven't read it, get a copy today! Dream Messages from the Afterlife features dream visits from the dead, deathbed visions, precognitive dreams of death and related topics. Everyone has had a remarkable dream about the dead, and some of these experiences are powerful and life-changing. Dream Messages from the Afterlife validates our experiences of genuine and meaningful meetings with people who have died, meetings that take place in the dream world. It explains the different purposes of such visits, the how and why behind them, and how to discern real visits from ordinary dreaming. 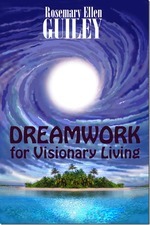 Dreamwork for Visionary Living covers extraordinary dreaming involving spiritual messages, psychic factors, creativity, healing, lucidity, and more. The book features 37 "dream labs" that offer tips and instructions for pro-active dreaming. Dreams cover much more than daily life, and they play an important role in our overall well-being and life journey. Develop Your Miracle Mind Consciousness discusses the components and conditions of miracles, historical views on miracles, and ways we can become co-creators of miracles in our lives. Miracles are life-changing events! 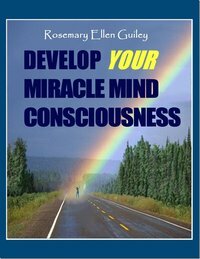 Develop your Miracle Mind Consciousness is an informative, entertaining, and visionary must-read. Those desiring to awaken their innate ability for miracle manifestation will find this book liberating, and those seeking a personal understanding of the afterlife and consciousness will learn to recognize miracles of all sizes from the other side. Shadow People and the Djinn with Alexis Brooks on Conscious Inquiry, click here. Beyond Belief with host George Noory on Gaiamtv: See a preview of my episode Mistress of the Spirits. George and I cover angels, fairies, spirit communication, what to expect in the afterlife, and the Ouija board -- all in one hour! November 4 -- The Haunted Harvest Moon show with Vonda McDaniel, 7-8 PM EST. Topic: Haunted by the Things You Love, true cases of objects haunted by spirits and curses. On Z Talk Radio. November 9 -- The Conspiracy Show with Richard Syrett, 12 midnight-1 AM EST, Zoomer Radio AM 740, Toronto. Topic: Paranormal news roundup and commentary, and open lines. November 12 -- The Bill Feingold Show with Kevin Holmes, 11:35 AM EST 8:35 AM PST, KNEWS 94.3 FM and 970 AM, Palm Springs, CA. November 13 -- The Happy Mediums show with Lillee Allee and Debra Freeman, 9-10 PM EST, on blogtalkradio.com. November 25 -- Exploring Unexplained Phenomena with Scott Colborn for the KZUM FM 89.3, Lincoln, NE, 11:30 AM-1 PM EST, 10:30 AM-12 noon CST. A double bill with John Zaffis on "Haunted by the Things You Love." November 23 -- KTPF Paranormal Community Talk Show, 3:30 PM EST, www.ktpf.org. Topic: Djinn and Shadow People. The following are my confirmed event appearances during the remainder of the year. I'm always adding new ones, so keep checking the list here and on my home page at visionaryliving.com. In addition to these events, I also arrange private events for groups. Email me at reguiley@gmail.com if you are interested in a special group event. I am already booking well into 2015. Discussion of the British Exopolitics conference, interdimensional aspects of UFO research, and latest activity in the Hudson Valley. At the Yonkers Public Library, 6-9 PM. 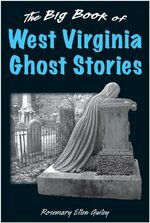 True accounts of items afflicted by attachments of spirits and the dead, and by curses. At the Ice House, corner of Mercer and Independence streets, 7-9 PM. Tickets $8 at the door. Visit my vendor table at this popular psychic fair and alternative healing expo for my books, CDs and black mirrors, and for Tarot readings. At the Ice House. Talk on dreams and dream incubation on Sunday from 1-1:30PM. How and why the dead are able to make real visits with the living via temporary bridges in dreams. At Omen, 184 Essex St., 7-9 PM. TO SEE MORE OF MY WORK IN PRINT AND E-BOOK FORMATS, VISIT VISIONARY LIVING, INC.